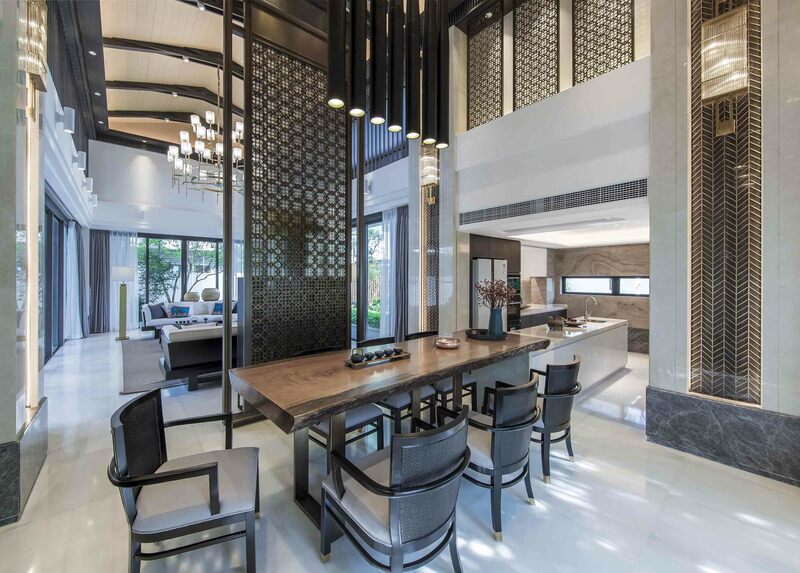 This week’s instalment of the #SBIDinspire interior design series features a lavish villa apartment in the coastal province of Southeast China which strives to harmonise people, space and nature by connecting the interior and exterior environments for the ultimate luxury vacation. 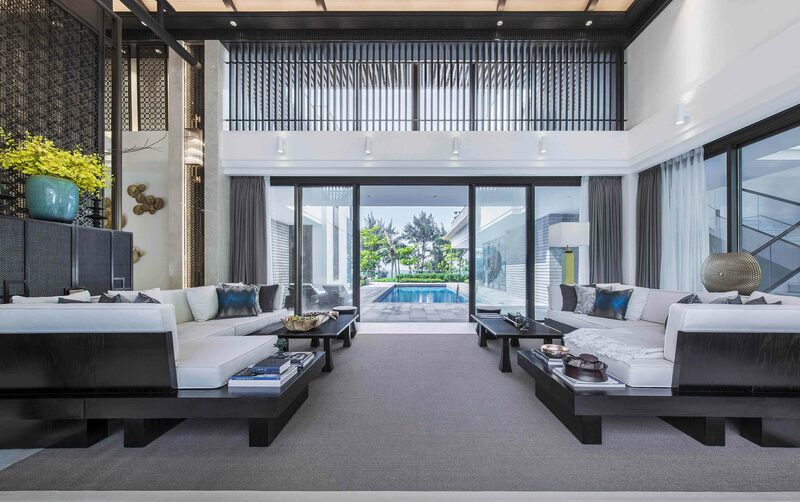 A design which balances indoor and outdoor space; plays with light and shadow; combining neutral tones with dark accents; whilst juxtaposing decorative, oriental style elements with clean, modern lines and simple, yet sophisticated structures to incorporate themes of contemporary design, embody Southeast Asian craftsmanship and evoke a sense of exotic elegance. 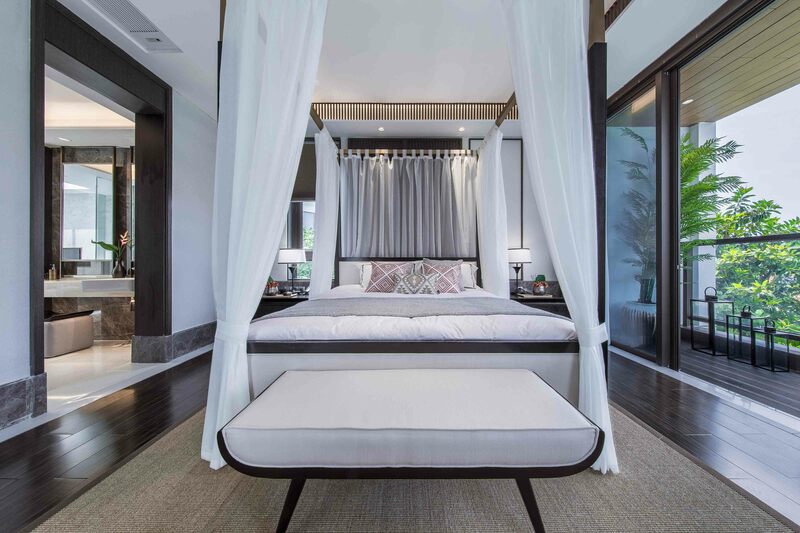 The Client’s main hope was to create a luxurious villa apartment which generates a relaxing vacation environment which connects people with nature in a simple and well balanced way, embracing the relationship between people, space and nature. 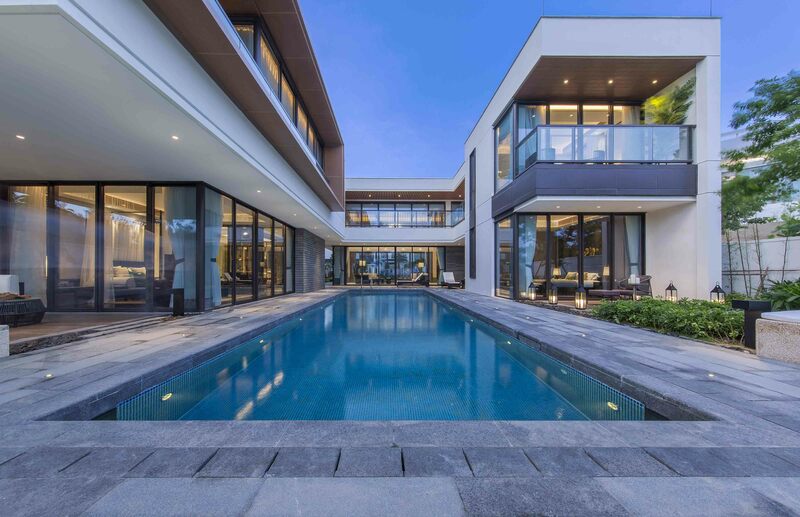 As the project is close to the seaside, the sound of the sea breeze can be heard in the distance and the smell of salty water hangs in the air, so visitors instantly get the feeling of returning to nature. 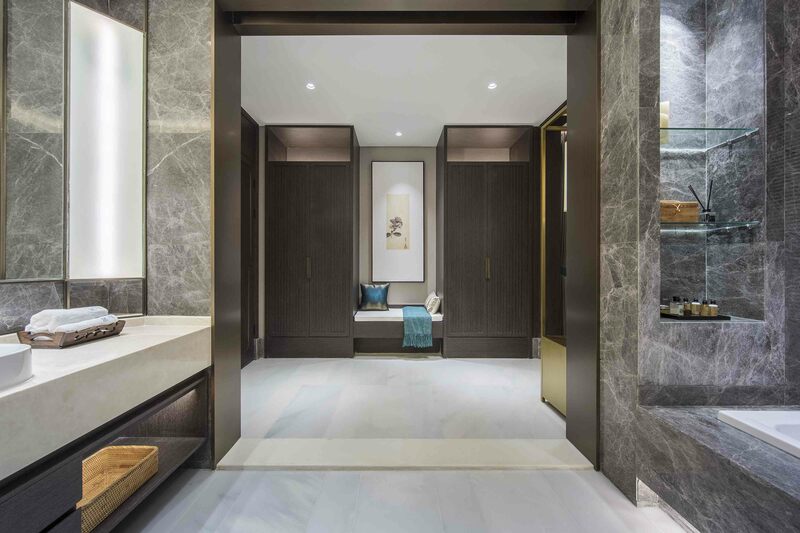 Combining a simple, neutral colour palette throughout to evoke a calm atmosphere, with dark accents of wood and marble on selected surfaces and furnishings helps to balance the neutrals to exude a deep natural flavor. 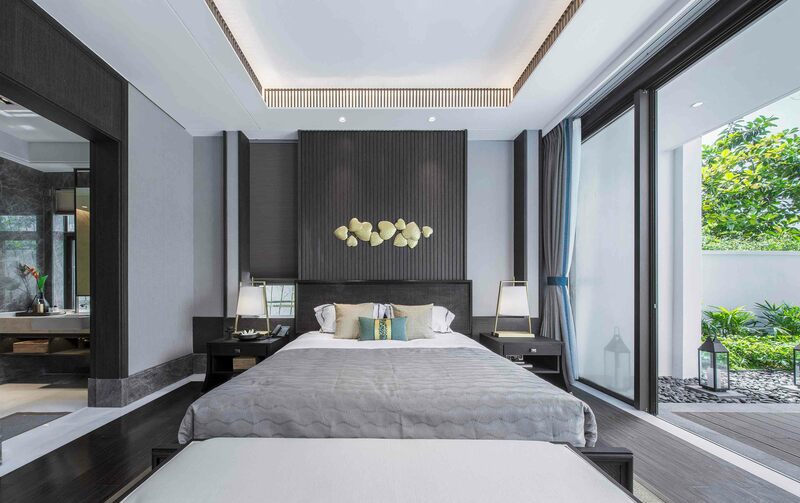 The project abandons complex decorative lines, replaced by simple structures and neat styling, balanced with subtle inclusions of more exotic elements such as Thai inspired cushions and oriental ornamental features. 1.Using a small selection of simple, natural materials and a harmonious layout throughout the project to create a comfortable life between people and nature; people and space; and also between people and people. Striking a complimentary balance of each of these core components of space, nature and people was the main challenge. Each space needed to be in touch with nature, create communal areas for socialising, as well as spatial divisions for privacy, allowing visitors personal time to reflect and connect with nature. 2.Because the project is near the sea, selecting the right materials required careful consideration to prevent any corrosion from the salty atmosphere. 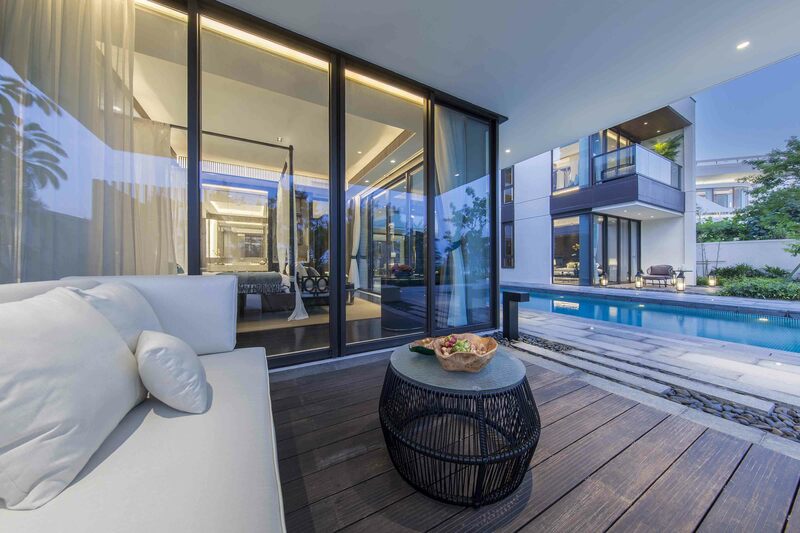 Seeing the careful marriage between indoor and outdoor, as architecture and garden combine to become an organic whole. Creating a space that will be in sincerity with Southeast Asia, through elements of solid wood and rattan to express and bring a heavy sense of culture, whilst incorporating themes of modern life with the essence of freshness and simplicity to reconcile the whole space and create a haven away from the hustle and bustle; returning to nature, inside and out. 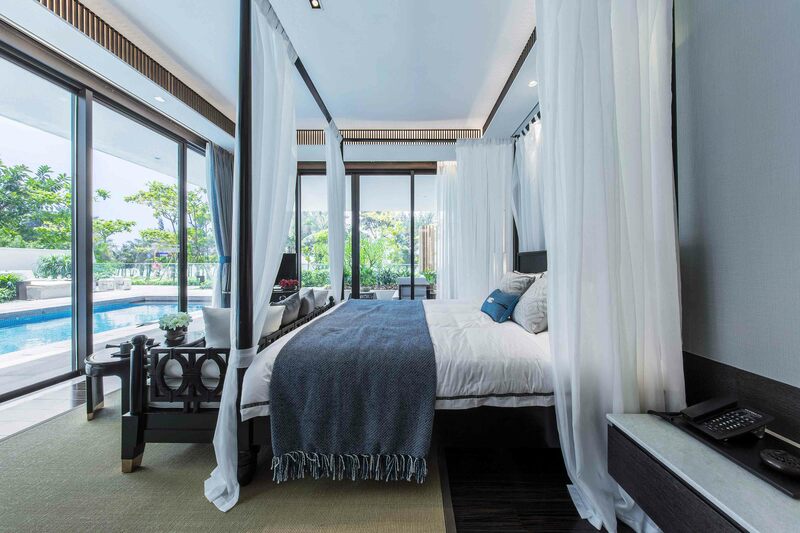 Every detail considered, even down to the white drapes hanging on the bed frame to give a therapeutic, dream-like vision of the gentle sea breeze fluttering as the space appears light, lazy and gorgeous. Also, seeing the play of light and shadow change room by room, so that each space transforms with the phasing of the day from dawn to dusk. The SBID International Design Award is the World’s leading design award and enjoys wide popularity in the design world at home and abroad. We participate in the SBID International Design Awards in the hope that our design can be seen and shared with more people, so that ideas can collide across the continents and inspire globally with beauty and design excellence. 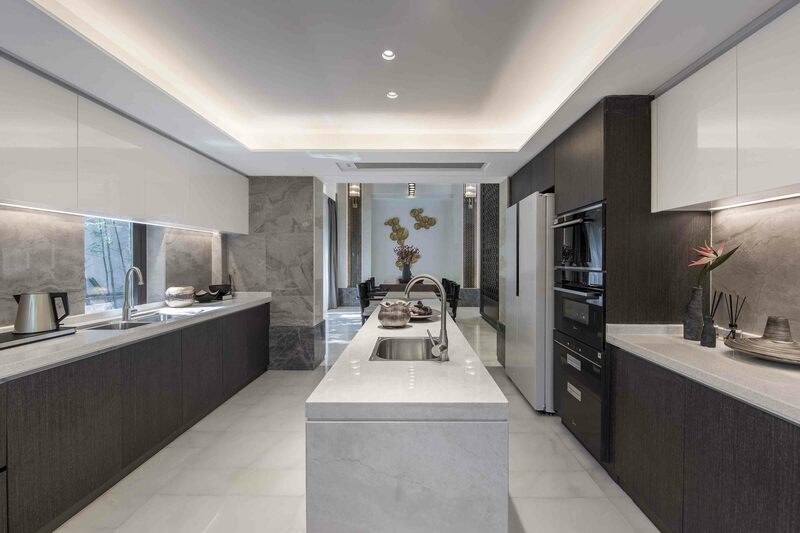 If you missed last week’s Project of the Week featuring a stunningly stylish SieMatic kitchen design in the opulent Alderley Edge, click here to see more.